The Health Center is open Monday through Friday from 8:00 am to 5:00 pm during the academic year and the summer sessions. 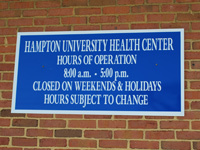 Services are provided by a physician or nurse practitioner during clinic hours. Students are encouraged to call for an appointment. Same day appointments are available. For appointments, please call 757-727-5315. A registered nurse is available on call 24 hours to answer questions and concerns when the Health Center is closed. Please call University Police if you need to speak with the on call nurse. In an emergency please call University Police who will dispatch EMS/ emergency medical services. Call 757-727-5259 to reach University Police.